It has often been said that prevention is the best medicine. This is true not only for health but also for the care of one’s home. Anyone who has gone through the process of replacing the plumbing in their home can tell you that it is an expensive hassle. Here are some tips for plumbing leak prevention in the home to help you avoid an unexpected plumbing leak. The fact is, you might have a leaky pipe or two right now. Many times, large leaks start as small leaks and continue growing until they become a major problem. The mistake that many people make is ignoring the problem until it becomes impossible to ignore. You should make a checklist for the maintenance of your home and include a regular pipe check as part of your routine. This is an important step for plumbing leak prevention in the home. Open up each cabinet that has a pipe inside and use a dry cloth or tissue to wipe the connections. If any wet spots appear on it, this means there is water leaking from the pipe. A tiny leak from an under cabinet pipe can slowly rot the cabinet or floor. For most household activities, a high level of water pressure is unnecessary. Not only will it put undue strain on your plumbing system, but it will also increase your water bill. For purposes of plumbing leak prevention in the home, you should use only the amount of pressure that you really need. You can adjust your water pressure at the meter. Bring a pair of strong pliers to the water meter, open the lid, and turn the valve slightly counterclockwise to decrease the water pressure. A good psi to shoot for is 40-45. It should never exceed 60 psi. Winter is the worst time of the year in terms of plumbing problems. If you are fortunate enough to live in a climate where the temperature never gets below freezing, you can safely ignore this section. For the rest of us, we already know just how frequently a pipe will freeze and burst in freezing temperatures. You can take two specific measures to avoid this problem. One of them is to insulate all your pipes. 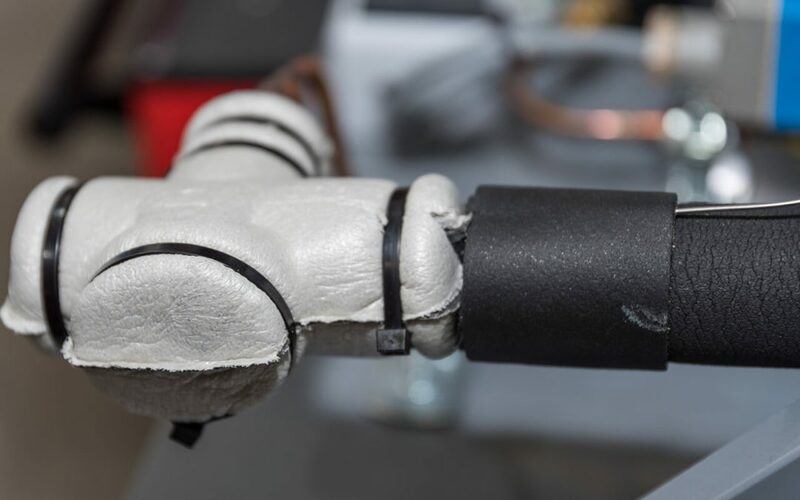 Pipe insulation is cheap and easy to apply, so you won’t need a great deal of time or money to do this. Simply take the split pieces of tubing, place them around each pipe in turn, and use the included adhesive strips to stick them together. This will go a long way toward plumbing leak prevention in the home. Another thing you can do is to leave your faucet dripping when the temperature gets below freezing. Moving water is less likely to freeze, as the friction of its movement will generate just enough heat to prevent the water from freezing and expanding. Encompass Home Inspection Service provides home inspection services to Southern New Jersey and Southeastern Pennsylvania. Contact us to book your appointment.